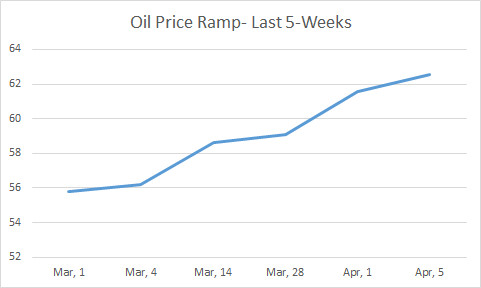 Oil made quite a run in March, confirming our thesis that it is headed higher in the near term. We review the macro environment for oil in the Almanac. We added a new permanent author to expand the service. An introduction will be made. We talked about a lot of companies this month, and will provide a sample of some of those discussions in the Gazette section. Oil (WTI) has made some very positive progress higher in the last month, in the face of what could have been some strong headwinds. The chart below shows a 12% gain for the period. Oil has laughed off some significant adverse indicators in recent weeks to make this move. A bad jobs number leading to concerns about global growth. A shutdown of the Houston ship channel that led to a two-week build in inventories of about 9 mm bbls (much of U.S. crude is being exported, and if the Houston ship channel closes, that can't happen). Seemingly ever increasing volumes out of U.S. shale through February. Several months ago, any one of these could have taken oil down several dollars a barrel in a single day. This week a 7-million barrel add to storage, barely affected the final daily price. What's propelled crude forward in spite of these headwinds? The Fed tapping the brakes on the tightening policy of the last couple of years. The repeated declaration of the Saudis to raise global pricing, through declining exports to the U.S. Some signs that shale drillers are taking a drilling pause to let prices improve a bit. Signs that shale productivity may be leveling off. The generally positive comments coming out of the China trade talks. The macro environment for oil has improved dramatically since the winter of despair, just last quarter. It was hard to realize then that daylight might be just around the corner, but come it did. 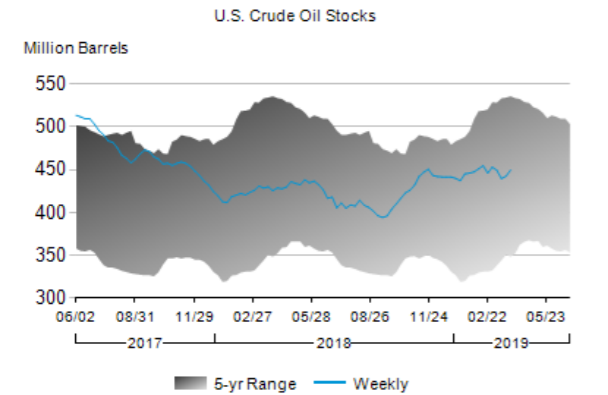 As I've said in prior articles, with these factors underpinning it, oil should soon regain previous highs taking stocks in our portfolio with it. The market has been obsessed in particular that burgeoning shale production would overwhelm cuts by Saudi, driving prices down. That fear appears to have not been realized as Saudi exports are at lows as compared with last summer. As you can see on top, Saudi shipments are way off the highs and below, you see total imports are down 40% from a year ago. What hasn't changed is our consumption, we are just substantially more self-sufficient than we were a year ago, with domestic production of 12.2 mm bbl as of the EIA March 29th report. What is of particular interest to us is that over the past 6 months, inventories have been largely flat-lining, maintained by constant flow from shale. 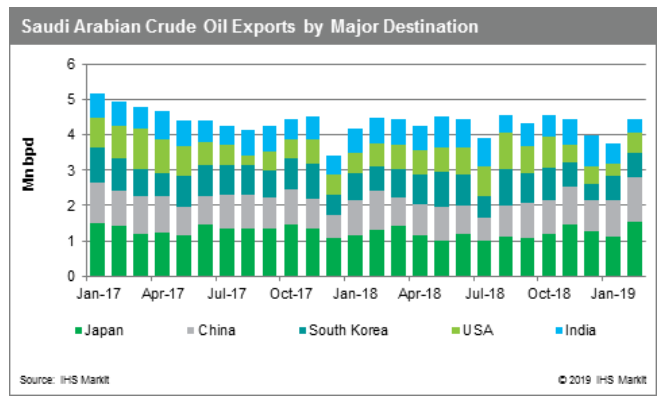 This is again reflective of Saudi's determination to reduce U.S. crude storage, that was a buffer to rising prices in 2017. If the Saudis have anything to say about it, the end of the blue line will dip sharply down soon. All of this sets the stage for oil to continue higher. How high? I don't play that game, but I doubt barring some cataclysmic event, that WTI goes above $70, and Brent much above $80. Why? President Trump will almost assuredly start releasing crude from the SPR to moderate prices, as he has threatened to do. Already 6-mm bbls are on offer to blunt the re-imposition of sanctions on Iran, and that could easily be scaled up if prices took off. While past administrations have used this tool sparing to control prices, I think Trump might open the flood gates. He is a low oil price guy from the get-go. Somebody from the oil patch ought to invite him to hold a rally in, say Midland or Odessa. He has a lot of friends in the patch who'd love to bend his ear about good American jobs in the oilfield. Would it change his thinking about low oil prices? Probably not, but you never know. Trump has been known to modify his thinking when presented with the facts. And, of course when prices go much above the $70-80/bbl range, consumer behavior starts to change, and demand moderates. The way things should work actually! The good news is that the industry doesn't need higher prices. With the cost-cutting that's taken place onshore, and offshore there are very few projects that aren't economic at these, or much lower levels. What the industry needs more than anything is some stability above $50/bbl. If we see this higher pricing regime last for a few months, new project sanctions will come flying. I am happy to announce a partnership with Badsha Chowdhury beginning April the first. He is now a Promoting Author with a stake in the success of the blog. Accordingly, he will begin publishing much of his work to the Daily Drilling Report well before it hits the Free Side. Badsha has been writing on the energy industry for a number of years, and has worked as an energy equity analyst for a number of well-known online publications; among them Market Realist and Zacks Research. He also holds an MBA in Finance. He joined Seeking Alpha as a contributor in September last year, and has established a fairly prolific publishing record since, logging over a hundred articles since. Badsha has a knack for tracking down under-covered companies and doing a deep dive on their prospects. For example, it was an article on Core Labs that first brought him to my attention, and I gave him a "follow" immediately. I think his contributions will add a lot of depth and value to the site and think you will agree. In the Gazette we give an overview of companies that we've covered in detail in the DDR during the prior month. Two that will be highlighted in this month's edition are Halliburton (HAL) and Noble Energy (NBL). Halliburton. Hally has languished comparatively speaking against its usual cohort group, its exposure to North American shale fracturing a likely source of its current malaise. Things could be changing. A buy recommendation was made last week when it was in the high twenties. We think there is some unrealized value in Big Red for a couple of reasons. It has since moved into the low $30s (again), and should continue higher after Q-1 earnings. Remember, expectations are already low. Now here are a couple of reasons (there are others, but this is a digest article and we need to be brief) why it is headed up! First, Hally sells at a discount to the other major service companies. A case can certainly be made that Schlumberger, due to its larger size and footprint, deserves a premium to Hally. But, Baker Hughes (BHGE) and National Oilwell Varco (NOV) selling at a premium to Halliburton just don't stack up in my view. The market will realize this at some point. One analyst at Ray Jay is already putting a "buy" on Big Red, and a price target of $45 over the next year. Quite a bit of upside from current levels. I think other analysts will join the chorus soon. The other driver I see for Halliburton is the DUC inventory. As discussed above, we've seen drilling moderate over the last few months, and while it rebounded sharply this week, it is only slightly ahead of 2018, and down about 55 rigs from last year's highs. There are currently close to 9,000 DUCs awaiting completion. This is "duck stew" for Halliburton as 2/3 of its total business lies in completions. For the uninitiated, Fracking is part of shale completions, and Hally is the King of Frac with over 4 mm HHP in various U.S. shale plays. So, with the "forecast to be slow" first quarter behind us, things should start to pick up for Hally. As prices rise there is an incentive to pull DUCs out of storage and put them online. That of course will lead to new drilling. The perpetual shale machine rolls on! After earnings we will be back with a complete "soup to nuts" article on Big Red. Noble Energy. Moving on from the service sector to operators, back in late March we took a hard look at Noble Energy (NBL) and focusing on their mammoth Leviathan project, offshore Israel. As you can see from below, Noble was beaten down badly in the Q-4 debacle of 2018, and has recovered a lot since. We think that will change soon. Discovered back in 2010, it's taken nine long years of infrastructure build-out and all kinds of geopolitical issue resolution to bring Leviathan to this stage. It is now time to begin monetizing this beast, and none of this additional cash flow, as much as a billion dollars annually, is priced into the stock. Leviathan will begin to ramp in late 2019. At full development it is forecast to flow 1.2 bn bcf/d of dry gas to power-hungry customers. Worthy of note here is the expectation for a 10-year plateau once maximum production is reached, before gradual declines set in. Compare that with shale production declines of as much as 70% in the first year. Another revenue opportunity for Noble is its Alen project offshore Equatorial Guinea. 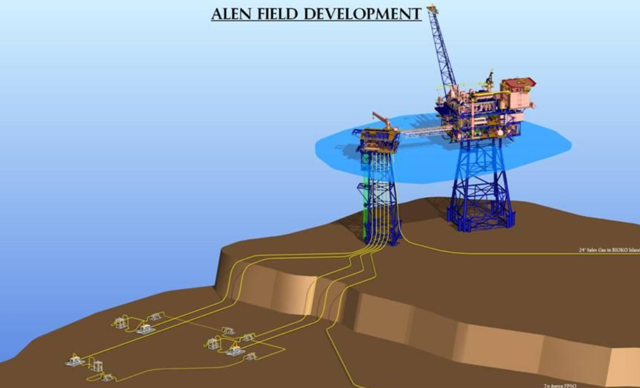 Alen is a group of subsea wells tied back to shallow platform structures. So far associated gas has been re-injected to maintain reservoir pressure, but now, thanks to a new sanctioning, will be produced to a liquefaction plant to be processed into LNG. Additionally, about 3-TCF of gas from fields in the Douala basin can be monetized through these new facilities. 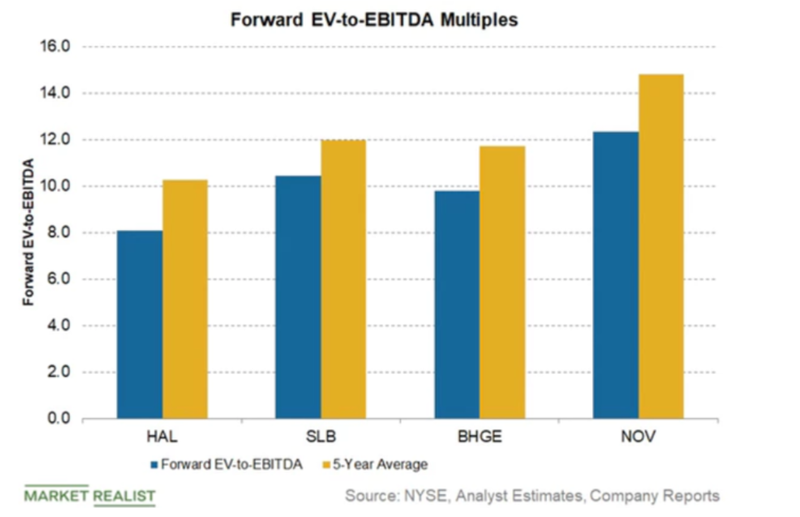 Additional future cash flow that isn't reflected in the current stock price. When you add reduced capex going forward, low debt to equity, to increased cash flow, we think that there is room for this one to move up fairly rapidly in this more, shall we say, "accommodative" environment for oil. It has risen along with the general market this week to almost $26.00/share. 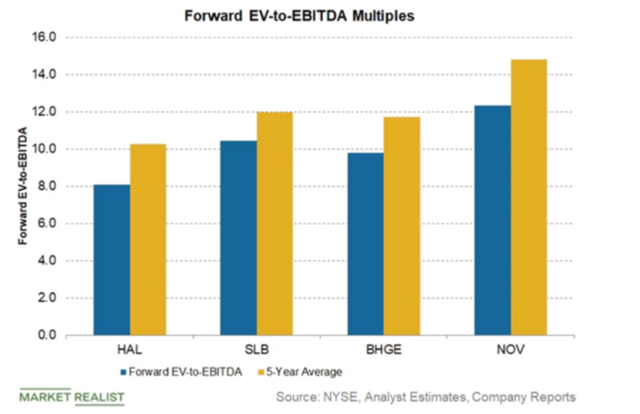 We think with the metrics mentioned above a return to the mid-thirties is entirely possible for Noble Energy over the next year. We will be releasing the entire thesis for this company soon to the free side, so if you're interested, give us a "Follow" and be notified when it is available. The service sector is probably where most of the "quick returns" will be in the energy trade as it receives new capex. It typically lags the operators, as it needs the capex the operators provide to ring the cash register. We've seen nice gains in the OSV space so far this year, and expect more of the same as the year unfolds. If you've been smart and squirreled away some capital for just the "right moment" and the oilfield service space interests you, that moment is nigh upon us. I hope you will think about a subscription to this service. I am different than anyone else covering the oilfield on Seeking Alpha. I have spent years on drilling rigs, working with oil companies, and intend to put this knowledge to work for all of us. If you are looking to repair a damaged OFS portfolio in 2019, let me be your guide. Disclosure: I am/we are long HAL. I wrote this article myself, and it expresses my own opinions. I am not receiving compensation for it (other than from Seeking Alpha). I have no business relationship with any company whose stock is mentioned in this article. Additional disclosure: I am not an accountant or CPA or CFA. This article is intended to provide information to interested parties. As I have no knowledge of individual investor circumstances, goals, and/or portfolio concentration or diversification, readers are expected to complete their own due diligence before purchasing any stocks mentioned or recommended.